Auditoriums represent one of the most complex types of room environments for designing and integrating – because of the sheer scale of scenarios they need to be used in. The primary concern in an auditorium (which could seat from 25 to over 1,000 people), is to ensure that each and every seat allows members of the audience to see and hear the “event” clearly. Also, considering that most events conducted at this scale are very public in nature, it’s important to ensure that the event managers and choreographers have access to powerful tools to control various aspects of the event. This might include aspects like – sound, lighting, drapes, visual displays, camera’s etc. Audio design and engineering is one of the most important aspects of auditorium design, and one that probably has the maximum impact on audience experience. The auditorium must be acoustically treated on the sides and ceiling; and the sound system design must take into account the acoustics and noise level of the room. Many auditoriums get this wrong despite considerable investments and attention. A Floor Box for appropriate connectors must be provided for stage performances that require a range of microphones. Visibility of the stage and the screen must be excellent and we need to ensure a clear line of sight by providing sloped floors and staggered seating, and also confirm that the screen height (diagonal) is at least 1/6th of the distance between the screen and the last row. Any smaller and the visibility of the screen content will be compromised for people at the back. A high-resolution (FullHD or 4K) and high brightness projector (above 5,000 lumens) is another critical element along with the type of screen deployed. 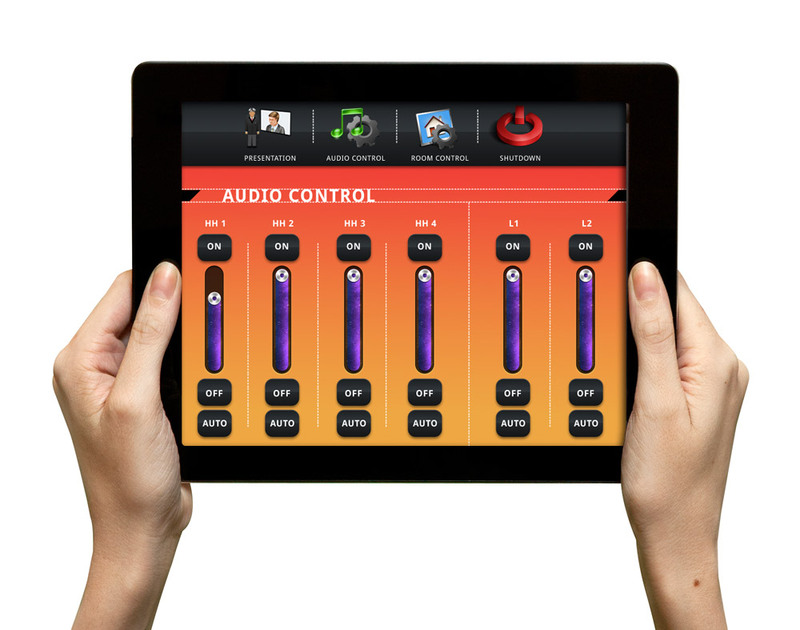 Centralised control via touch-based controllers is necessary for easy control of system in the high-pressure environment that high-profile live events inevitably create. These control systems can be integrated with almost any electronic or electrical system including HVAC, sound systems, lighting, drapes, AV devices, projectors, screens, cameras, video conferencing systems etc. Mechanical systems noise control and vibration isolation is very important in the auditorium environment, because HVAC noise and mechanical noise from other systems impact room acoustics, structural vibration, and exterior noise levels. A systematic noise measurement study is needed to decide on modifications to mitigate the impacts of these noise sources. Stage lighting is another great tool for ensuring visibility and setting the right mood. It enhances the aesthetics of the setting and is extremely crucial in live performance situations such as plays or musical events. Flood lights, wash lights, spot lights, scanners, moving heads, lasers come together to form your lighting system, which can be programmed and managed remotely with a digital DMX mixer.